The key theme of our service is to achieve the optimum balance of cost and quality, with a clear focus on supporting business and customer satisfaction. As one of the largest payroll providers in West Yorkshire; we specialise in educational establishments and local government, providing a seamless employment services package from new starters through to pensions administration which represents excellent value for money. We currently provide payroll and employment services to 270 organisations across 45 different employers on multiple terms and conditions, paying 38,000 people accurately and on-time each month. We are committed to delivering the highest standards of custome​r service​ and provide dedicated support including communications and training, and bespoke management information. All of our service options can be tailored to meet your business requirements. We ensur​e that our staff have the relevant knowledge, qualifications, technical skills and experience to provide professional advice. 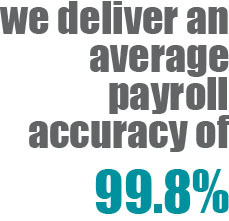 On average, our staff have more than 15 years payroll, pensions and HR experience and hold a range of professional qualifications from organisations which include; the Chartered Institute of Personnel and Development, the Chartered Institute of Payroll Professionals and the Association of Accounting Technicians. I have been very impressed. The BSC have reassured me completely that moving to Voluntary Aided status will be seamless. This is a fabulous endorsement for their unstinting professionalism and commitment to provide customers with the best possible service.